Photo by S.S.K. 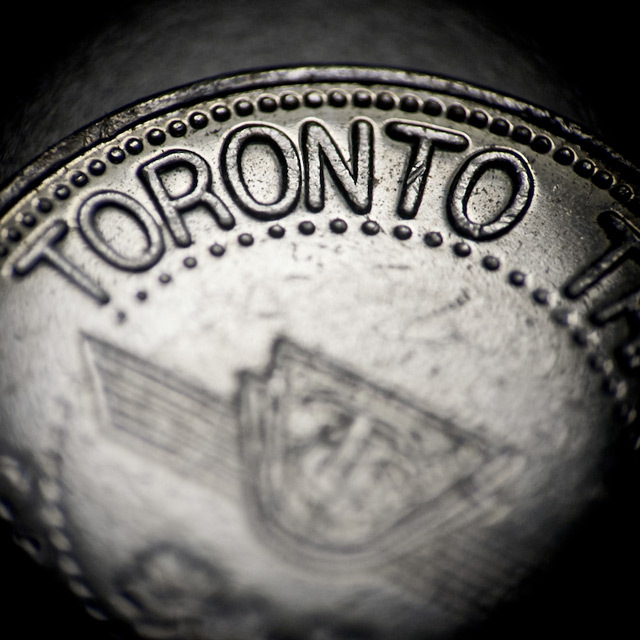 from the Torontoist Flickr Pool. Adult cash fares will rise from $2.75 to $3.00; tokens from $2.25 to $2.50; weekly passes from $32.25 to $36.00; Metropasses from $109.00 to $121.00; Metropasses purchased as part of the Volume Incentive Program (or VIP) from $96.00 to $107.00; and Metropasses purchased under the Metropass Discount Plan (or MDP) from $100.00 to $111.00. Senior/student cash fares will rise from $1.85 to $2.00; tickets from $1.50 to $1.65; weekly passes from $25.50 to $28.00; Metropasses from $91.25 to $99.00; and MDP Metropasses from $84.00 to $89.00. Child cash fares will rise from $0.70 to $0.75; tickets from $0.50 to $0.55. Day passes will rise from $9.00 to $10.00. The TTC portion of a GTA Pass will rise from $25.30 to $29.25. The better news amidst all of that is that, as of September 2010, “anyone enrolled in a post-secondary degree or diploma granting program,” as the TTC’s release defines it, now qualifies for a student Metropass at the TTC’s student rate—for a significant part of Toronto’s population, in other words, a Metropass next year will be at least $10 cheaper than it was before. As we showed in our look at how adult fares have changed over the past thirty years, this hike—fair or not—was relatively predictable, which is why it makes sense that the reaction to the hike on Twitter so far has been largely intelligent and measured, with many riders understanding that the TTC’s move was a necessary, rather than a frivolous, one. Haha, just kidding; it’s Twitter. What’s that, djkidsupraa? djkidsupraa is not sayin’; he’s just sayin’. In Toronto, this is what happens when you charge people one-quarter of a dollar more for something. UPDATE: NOVEMBER 18, 2009 The TTC’s press release contained incorrect information about the price of an Adult MDP Metropass and VIP Metropass; the new costs were listed as $110 and $106, respectively, when they’ll actually cost a dollar more each (sacrilege!) as of January 3, 2010.